*Obligatory disclaimer 1/2*: Our view on the current club crest is well established, so we won’t retread old ground talking about it here. This review will focus on the aesthetics of the kit Umbro have supplied and the visual impact of any sponsor appliques added. *Obligatory disclaimer 2/2*: Some people don’t like the idea of third kits, they view them as unnecessary. 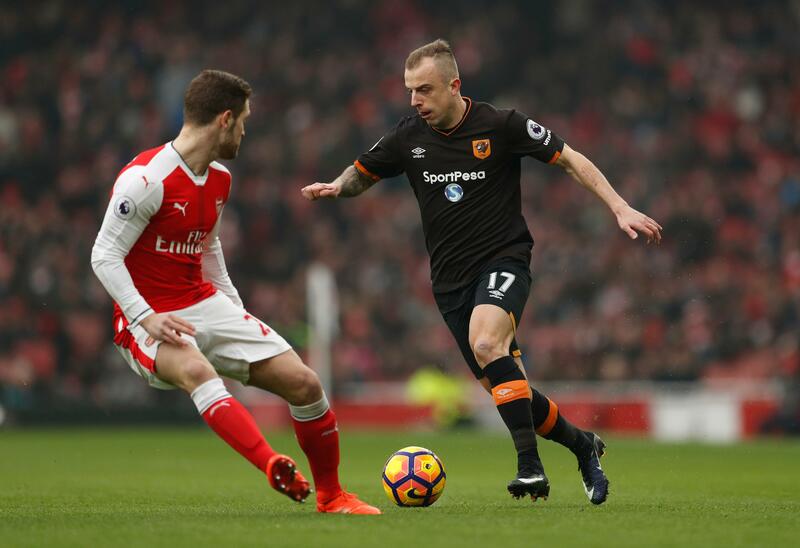 We have some sympathy with that viewpoint: when the dominant colour of a club’s primary kit is uncommon, as amber is, then a third kit is only truly necessary if the change kit fails to provide sufficient distinctiveness from the home kit. However we like kits, so we don’t mind there being more of them to like. 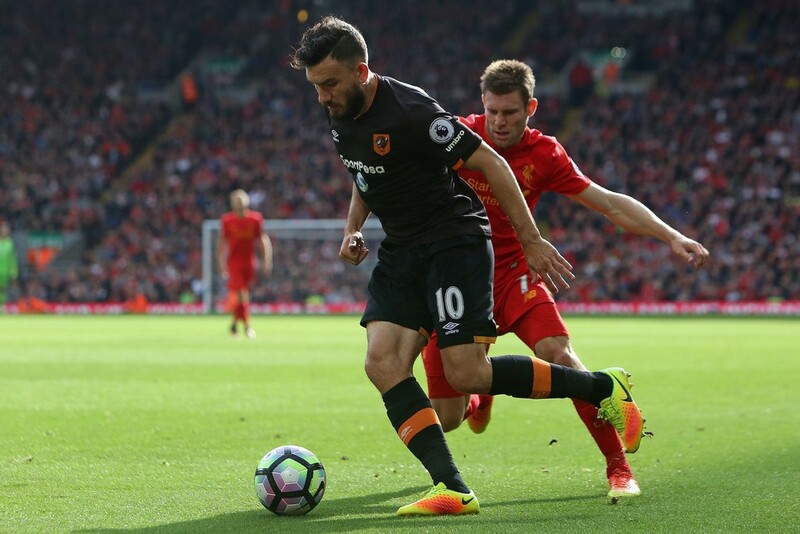 If you’re Manchester United or Real Madrid, sure, but Hull City order replica third kit in small quantities relative to the home and away kits, so they’re not a ‘moneyspinner’ to the club. That makes them merely an additional option. This is intended to be a review of an individual third kit, rather than an ethical discussion about third kits as a whole. 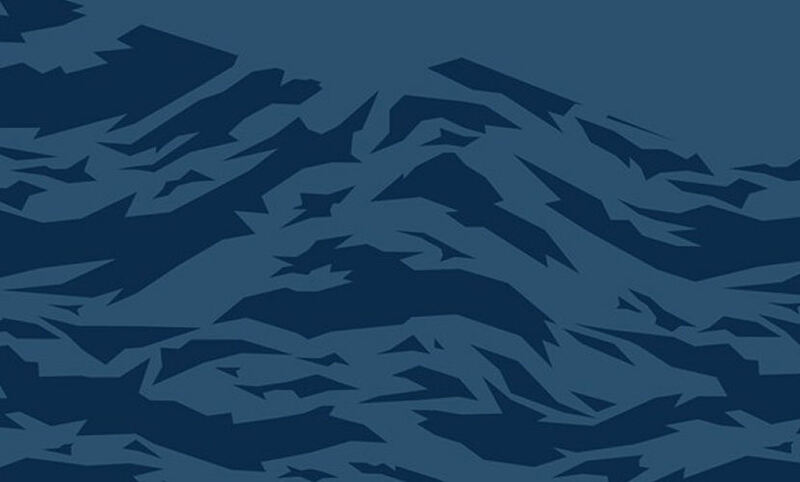 SombreEthyl: Navy peony eh? I do love the names of the colours Umbro use, cactus purple, blueprint and scuba blue, these Pantone names are an endless source of amusement. Future possibilities include Andean Toucan, Tibetan Stone and Byzantium. Navy peony is though a lovely colour, a deep, almost smokey looking blue that lends a classy look to this strip. Third shirts tend to be as much leisure shirts as football shirts, and I massively prefer this to a polo shirt I’ve seen some people wearing at games recently, black and white hoops. Seriously? 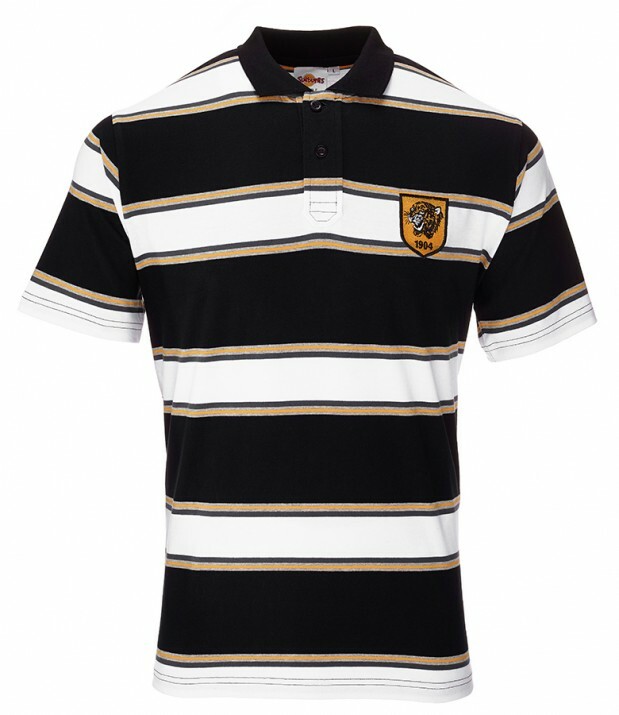 Hull City leisurewear based on Hull FC’s traditional look? Hmmm. I like the simple round collar, and the decision to use amber as the trim colour is to be applauded. 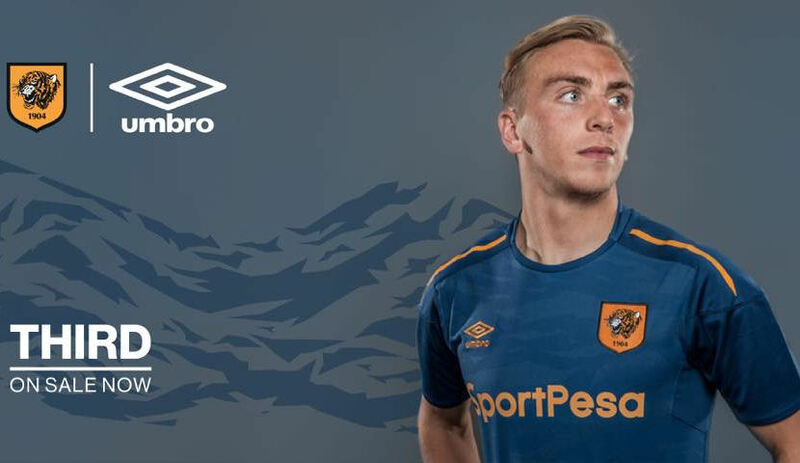 The marks of supplier Umbro and sponsor SportPesa, as well as striping on the yoke panels, are in the same amber used on the crest, and it complements the main shirt colour well, while maintaining ‘pop’. Good stuff. On some pictures the front body panel looks to be a different shade of blue to the rest of the shirt, but it seems that is down to how the light from the photo shoot lamps bounces off the differently constructed panels, because when you have the shirt in your hands under natural light the colour looks uniform. The back and sleeve pieces are more ventilated than the front panel, which has a jacquard weave of tiger stripes. Now, every now and then there is a clamour for City to base a new shirt on the 1992/93 home shirt, with it’s all over tiger stripe print. Personally I’m not in favour of that, I think such lurid prints belong back in the 90s, but a subtle jacquard weave on a third shirts? No problem with that. The amber stripe on the shirt yoke is replicated on the side of the shorts, and referenced on the socks with a thin amber hoop on the foldover bands. As an ensemble, this kit works. I do prefer the all-white change kit to this, but the third kit is very good and provides a dark shirt alternative when both the primary and change shirts are light. Third kits are only used on average twice. The outrage generated by the cactus purple shirts was massively disproportionate to their actual use, at Bournemouth and Watford. So when will we use the third kit? 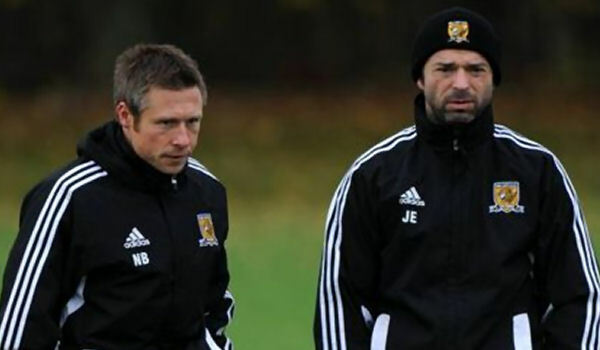 We’ll need a change kit at Norwich, but all white seems the better choice for clash avoidance there. 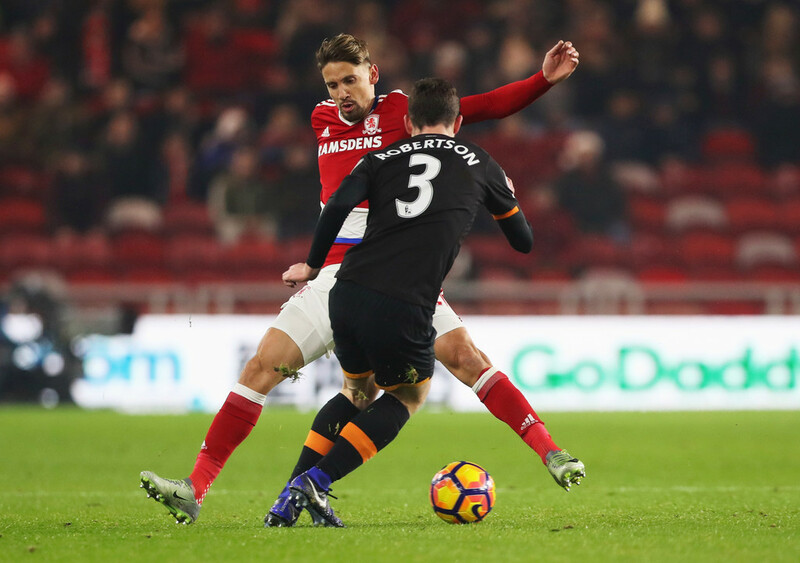 Barnsley could work, indeed any of the games at a red and white team are fair game, after all City have avoided using home shirts away to teams in red shirts on account of amber and red looking indistinguishable to colour blind individuals. If this is a consideration, then we could use the third kit at Middlesbrough, Nottingham Forest and Bristol City. Leeds away is a possibility too. Looking at all kit sets, I think Umbro’s City game is strong this year. The home kit is very good (an upgrade on 2016/17 I feel), the away kit is excellent (the best of the three in my view), and this third kit is pretty damn good. @JGHull: The third kit, then. We don’t need one but let’s leave that aside for a minute. I love a slightly nuts third kit. For me, it’s where you get permission from the fans to break any and every rule around club identity. Bright pink with yellow spots? Go on then. Why not? Stay away from making us look like any of our biggest rivals and after that, it’s something to talk about. We’ve gently paid homage to a kit from an era long gone. In blue. That we wear quasi regularly. Meh. This kit is just a bit ace too. Y’see, I think this template should have been the basis for this years home kit. I know, I know – in other posts on this very site I bemoan the fact that City should wear stripes at home. However, I get the reason for switching to a plain front every now and again. 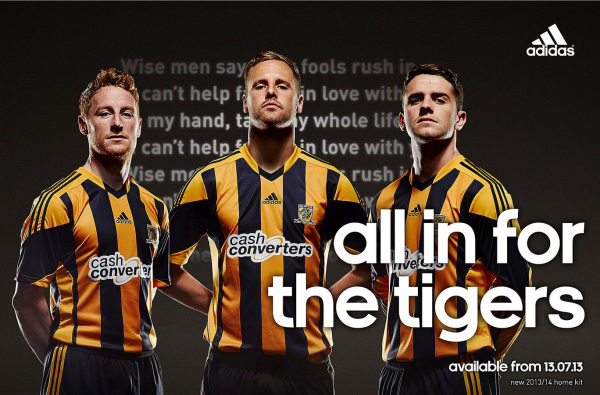 Commercially it makes sense and if done right, you can still get a good looking City kit. I think 2007/08 is probably the best example. It also means we wouldn’t have had to have those tram-smash shoulders and sleeves that we have on the current home kit. Squint a bit. Imagine the blue as solid amber. The amber trim bits now black. The tiger striping is now double brilliant. SportPesa applied in a solid black. Umbro taping on the shoulder. Black shorts and hooped hosiery. 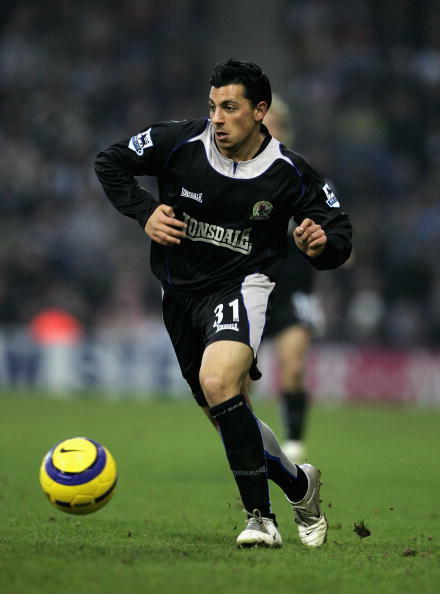 It might have been right up there as one of the classic City home kits. Instead we’ve got it in Blue (fine), as a 3rd kit (be braver) and that we’ll barely wear. I think we might have wasted the tiger stripe effect and I think that’s a shame. @MikeCarterHKR: I like it when clubs take up the option with their manufacturer to issue a third kit, as they are often a little quirkier than the standard home and away kits and they offer the chance to wear something other than regular club colours. So 2017/18 brings us deep blue with amber trim, and early feedback seems positive, especially with those who I’ve spoken to about it. I really like it. 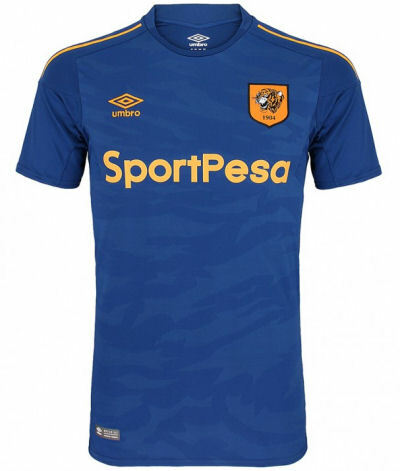 Hidden inside the design is a faint tiger print effect which I hope means that one day we may see more of the infamous design associated with the Tigers in the early 1990s. As with the other shirts, the crest has a fantastic brickwork pattern background which makes it one of the most striking and powerful on any Hull City shirt, ever. It helps me forget the monstrosity of a crest from the 2013/14 adidas kits. On the back of the shirt is ‘TIGERS’ which is in line with the 2017/18 home and away strips but it’s in one of the worst fonts imaginable. A new feature is the shoulder trim design, a heat bonded strip of plastic with Umbro logos. I’m a huge fan of the Umbro tapering on the home and away shirts as a tribute to Umbro’s history and heritage, but these matching heat bonded plastics gives us another subtle approach into manufacturer branding but without being too overpowering. 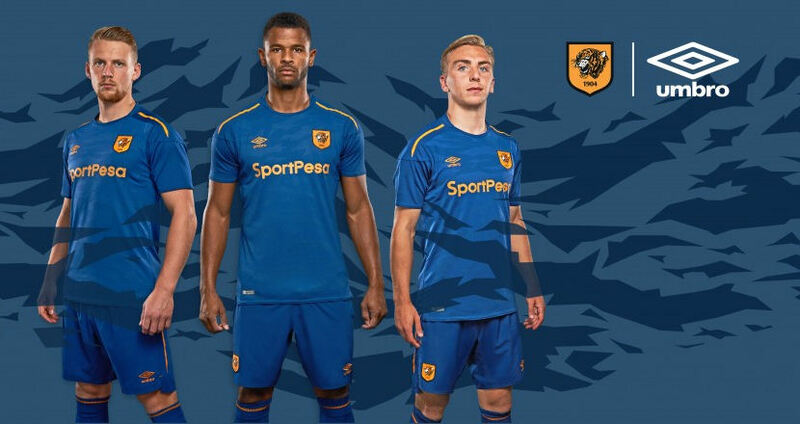 It’s also nice to see Sportpesa supporting the design by allowing a change in the colour of their logo to match the amber tone used in the strip. Overall the shirt scores highly with me, as someone who purchases every shirt regardless of colour, design or manufacturer, it’s nice to be able to wear a shirt which is different from the norm, but still expresses the club’s image at heart.